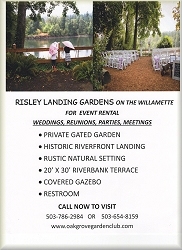 To rent Risley Landing Gardens (aka "The Gardens or the Park") a check payable to Oak Grove Garden Club, Inc. and a signed User Consent Form are required to confirm a reservation. Also, a Certificate of Liability from the renter's insurance company specifying coverage for the date of the event must be submitted at least two weeks prior to use of the Garden or Oak Grove Garden Club, Inc. reserves the right to keep the deposit and cancel the reservation. The Gardens may not be used by any renting individual or group for profit-motivated activities. The Gardens are available from 8:00 AM to dusk. Please let the gate opener know when you plan to leave. Suggested capacity is 100 people and the parking lot can only accommodate 20-25 cars. See Parking below. User to provide garbage bags, tables, extra seating and decorations and remove with all event trash and litter. Driveway is for pick up and delivery ONLY. Motor home use to be discussed and agreed upon in advance. Vehicles must stay in the parking lot or on the driveway. Any damage to the lawn, sprinkler heads, garden beds, riverbank terrace etc. and you will be liable. Children are to be supervised at all times. Our guests should use the paths and stay out of the planted beds. There is NO SMOKING allowed within Risley Landing Gardens. Barbecuing (propane only), any fires and the use of candles (only in glass containers) will be by permission only. NO FIREWORKS of any type are allowed in Risley Landing Gardens. No pets, leashed or carried, are allowed. Certified, or service animals-in-training are welcome. No loud music or loud noises, please. Respect the neighbors and confine music to the Landing area. No motorcycles, bicycles, scooters, skateboards or rollerblades are allowed in the Gardens during an event. 1. The Gazebo seats up to 35 people on built-in benches. Two water faucets are located outside on the south corners and two electrical outlets are inside the south corners. Push the red re-set button to restore power. 2. 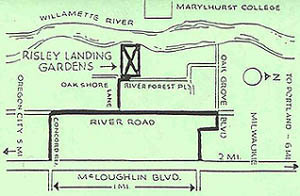 The landing depot foundation (20 x 30 feet) has seating on the walls and a view of the Willamette River. 3. The riverbank terrace are (30 x 60 feet) is level for tables with a river view but NO BEACH ACCESS. 4. An additional (10 x 60 foot) open hospitality area is under a large Douglas fir tree next to the driveway. 5. The unisex restroom has an outside electrical outlet on the southwest corner. 1. An attendant will open the gate(s) at a pre-arranged time. We recommend you appoint a person to direct parking and monitor the gate until all guests arrive, then close them to prevent intruders during your event. 2. Street parking is limited to the west (river) side of the street only. If you contact the NC12 school district you may be able to arrange parking at Riverside grade school on River Road and shuttle guests. 3. When ready to vacate call the gate opener who will come and go through a checklist with you before you leave. 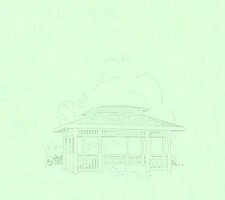 OAK GROVE GARDEN CLUB, INC. IS NOT RESPONSIBLE FOR PROPERTY LOSS, THEFT OR DAMAGE.